Tax fraud is a problem that affects every country around the world. As the Panama Papers and subsequent Paradise Papers exposed, many individuals and organizations use anonymous shell companies and intermediaries to move money to jurisdictions with favorable tax laws. Some of this is done legally, and considered tax avoidance, but tax evasion is done illegally, making it fraud. 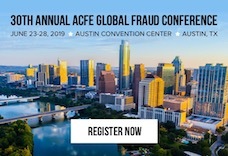 In his session at the 2018 ACFE Fraud Conference Middle East, Varun Mehta, CFE, discussed some of the challenges of tracking down tax fraud and how data analytics can be an invaluable tool in that fight. One of the main issues in investigating tax evasion is rooted in its very nature — tax evasion crosses jurisdictional borders in order to illegally hide taxable revenue. Tracing money from one country to another is hard enough for even the most skilled fraud examiners. When you add the fact that many transactions are done through intermediaries or anonymous companies, the puzzle becomes even harder to solve. Even with international bodies like the International Criminal Court, OECD and FACTA, human investigators can only do so much. However, Mehta, a fraud and security intelligence practice head at SAS Middle East, is optimistic about the future of tracing tax evasion. He says the key is for humans to work with advanced data analytics. However, using data analytics to catch fraudsters is not as simple as turning on a computer and running a program. Mehta stressed the importance of human investigators setting protocols for searches and flagging systems. He used phone numbers and dates as an example of how data in different formats can cause irregularities in analysis. Whether someone has used a country code or not could potentially cause a basic-level data analytics program to miss an important connection. Humans also still need to input criteria on what data is significant and what is not. For example, people living at the same single-family address is stronger proof that those individuals are related than people who share the same last name. “Everything is connected to everything else … but not all connections have equal significance,” he explained. Ultimately fraud examination must be a marriage of the two in order to be successful. Computers can crunch numbers and run through data but it’s up to human anti-fraud experts to define important red flags and characteristics of fraud.